The Constitutional Court(Tsets) of Mongolia / hereinafter referred to as the Tsets/ is the body which has full powers to exercise supreme supervision over the implementation of the Constitution, to render decisions on the breaches of its provisions, to settle constitutional disputes, and is the guarantor for the Constitution to be strictly observed. The principles, methods, forms and organization of the activity and the powers of the Tsets shall be determined by the Constitution and by this law. 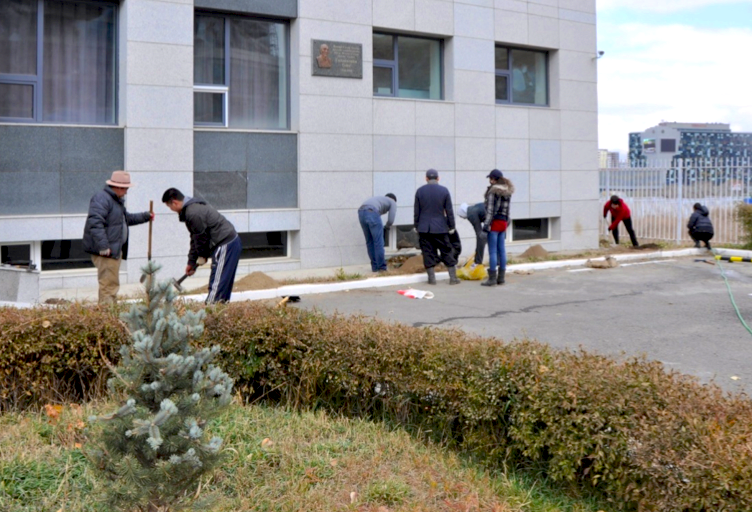 The Tsets shall be governed by such basic principles as independence, adherence to the Constitution of Mongolia, collegiality, impartiality, and openness. Any interference in the activity of the Tsets as well as any form of influence upon its members by any organization, public official or citizen shall be prohibited. 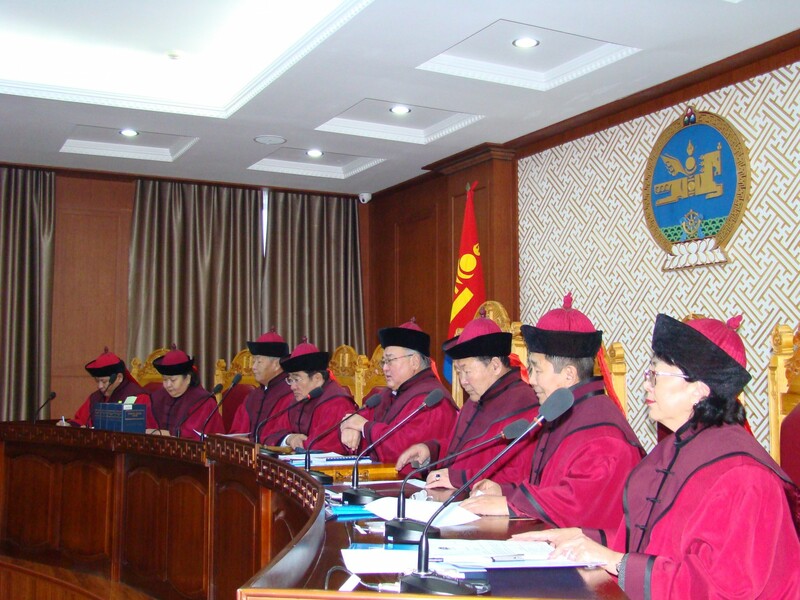 The State Great Hural shall appoint nine members of the Tsets for a six- year term upon the nomination of three candidates by the State Great Hural, three candidates –by the President, and remaining three candidates - by the Supreme Court. In nominating a person for appointment to the Tsets, the Chairman of the State Great Hural shall issue an order based on the opinions of the respective standing committees, the President shall issue an order, and the Supreme Court shall make a decision based upon a proposal agreed to by a majority of its justices. If the State Great Hural has declined the appointment of the proposed candidate to the Tsets, the body or the official, which has nominated this candidate shall nominate another person according to the procedure provided in paragraph 2 of this Article. In the event of accelerated withdrawal of a member of the Tsets, the body or the official, which had before nominated this member, shall nominate another person to the vacant position within 14 days. The State Great Hural shall accept or decline the nominee within 30 days. A member of the Tsets may not be the President, a member of the State Great Hural, the Prime Minister, a member of the Government, and a justice of the Supreme Court. A member of the Tsets shall not carry out any administrative, political and trade activities, as well as be a part of the leadership of trade unions. Where a member of the Tsets accepts a nomination for the post of the President of Mongolia or for the position of a member of the State Great Hural, the authorities of the member of the Tsets shall be suspended until the results of the election are announced. A member of the Tsets may not express in advance his or her personal opinions or conclusions to the media and public in any way on questions that could become a subject of consideration at the Tsets, or which is being studied or has been accepted for a consideration by the Tsets, until the adoption of a decision on that question. A citizen of Mongolia who has recognized high qualifications in the sphere of the law and politics, without a criminal record, and has reached 40 years of age, may be a member of the Tsets. The authorities of a member of the Tsets shall commence on the day of appointment and shall continue until the expiration of their term of office as provided for in the Constitution. In the event of involvement of a Member of the Tsets in a crime, the Tsets shall decide within 14 days whether his/her powers will be suspended after proposal on this respect were made by the competent bodies. A member of the Tsets may not be dismissed or transferred to other post, or recalled before the term of his/her office expires unless granting the application for resignation by a member, recognition of a member as incapable due to poor health, or on the grounds other than those specified in the third clause of this article. The same or an equal position and / or salary shall be offered to the member of the Tsets whose term of authority has expired or terminated before the schedule on the grounds other than those specified in the third clause of this article. If there is no such possibility, reimbursement of not less than the amount of salary earned as a member of the Tsets, shall be granted for the period of 6 month until the member is employed, and a reimbursement that equals the amount of salary difference shall be awarded over the same period from the state budget if the member lost in salary. A member the Tsets who has been relieved from office upon serving at least 6 years as specified in the Constitution, after reaching a retirement age shall be paid a pension in the amount of sixty percent of the monetary remuneration of a working member of the Tsets. Members of the Tsets shall nominate from its composition a person (persons) for the post of a chairman, discuss candidates at a plenary session, and shall by secret vote elect a Chairman with a majority of the total number of votes. If three or more candidates for the Chairmanship of the Tsets are introduced and after the first vote, none of the candidates has received a majority of votes, the second ballot will be conducted on two candidates who received the majority of votes during the first round, and the person who then receives a majority of the total number of votes shall be considered elected as a Chairman. ensure equal representation for each member of the Tsets, when determining the composition of the proceeding, allocate the functions of the members of Tsets, supervise their implementation, manage the budget, represent the Tsets in relations with other organizations and officials on administrative matters. 5.The Chairman of the Tsets issues directives and orders on matters within his/her competence. The Chairman appoints the member with the greatest work experience as a member of the Tsets as a Deputy Chairman of the Tsets. If several members have equaI work experience, the preference is to be given to the eldest member of the Tsets. 1.The Tsets shall be supported by its administration. The Chairman of the Tsets shall determine staff list of the administration within the budget adopted by the State Great Hural. 2.The Tsets shall have a seal, stamp, and letterhead. The Chairman of the Tsets shall hold the seal of the Tsets. 3.The State Great Hural shall adopt the budget of the Tsets, the salary fund, and the amount of salaries of members of the Tsets upon submission by the Chairman of the Tsets. A member of the Tsets shall wear a gown (special robe) during the sessions. The State Great Hural shall approve the description and the sample of the gown as well as the rules of use thereof. The Tsets shall exercise its supreme supervision over the implementation of the Constitution through rendering conclusions on the disputes specified in this Article and through settling disputes specified in the second clause of this Article. 2/ the conformity to the Constitution of decrees and other decisions of the President; 3/ the conformity to the Constitution of resolutions and other decisions of the Government; 4/ the conformity to the Constitution of international treaties, concluded by Mongolia; 5/ the conformity to the Constitution of decisions of the central electoral body concerning referendum; 6/ the conformity to the Constitution of decisions of the central electoral body on elections of the State Great Hural, its members, and the President. 5/ whether the legal grounds exist for the impeachment of the President, of the Chairman (Speaker) of the State Great Hural, of the Prime Minister, and for recalling members of the State Great Hural. A final decision of the Tsets stating unconstitutionality of law, decree, and other decision of the State Great Hural and the President, the decision of the Government, the international treaty concluded by Mongolia, the decision by the central electoral body shall repeal effect of the said law, decree, decision, and ratification document. A citizen shall submit petitions or informations with the Tsets on matters concerning the breach of the Constitution. /This paragraph was amended by a law of May 1, 1997/ 2.A citizen shall submit petition or information in writing which must indicate their names and addresses and a statement clearly describing what provision of the Constitution have been breached, by whom and in which way. The Tsets shall not accept any petition or information which does not indicate a name and an address of a petitioner. 3.A member of the Tsets shall study a petition or information within 14 days, and if the matter in question is not a constitutional dispute or does not fall within the jurisdiction the Tsets, then a notification stating the grounds for refusal to accept said petition or application shall be given to the petitioner. A member of the Tsets, if consider appropriate, shall transfer a petition or application to the respective organizations for consideration and shall notify the petitioner about his/her decision. 4/ the demand filled in connection with the request, existing evidences and other circumstances which are significant in resolving the dispute. /The name of this chapter was substituted by a law of May 1, 1997/ Article 11. /This article was omitted by a law of May 1, 1997 Article 12. The principles for resolving disputes. In considering and deciding a dispute, the Tsets shall adhere to the following principles: openness of the proceedings, directness and continuity of court sessions, except for in cases specially provided for by law, adversarial nature and equality of parties, collegiality, objectivity of decisions made strictly in accordance with this law. / Article 13 through 21 of this law were omitted by a law of May 1, 1997/ Article 22.Consequences of rendering a decision on the inconsistency with the Constitution. 1.The laws, decrees, other decisions of the State Great Hural and the President, decisions of the Government, international treaties signed by Mongolia, decisions of the central electoral bodies, considered to be unconstitutional by the Tsets, as well as revocation by the Tsets of its previous decisions shall not be considered as a sufficient ground for deciding the matters concerning the damage and other negative consequences caused by these laws, decrees, and treaties. If the grounds for leniency of criminal or administrative offence have been established, the matter may be reconsidered in adherence to the decision of the Tsets and in accordance with the relevant law. 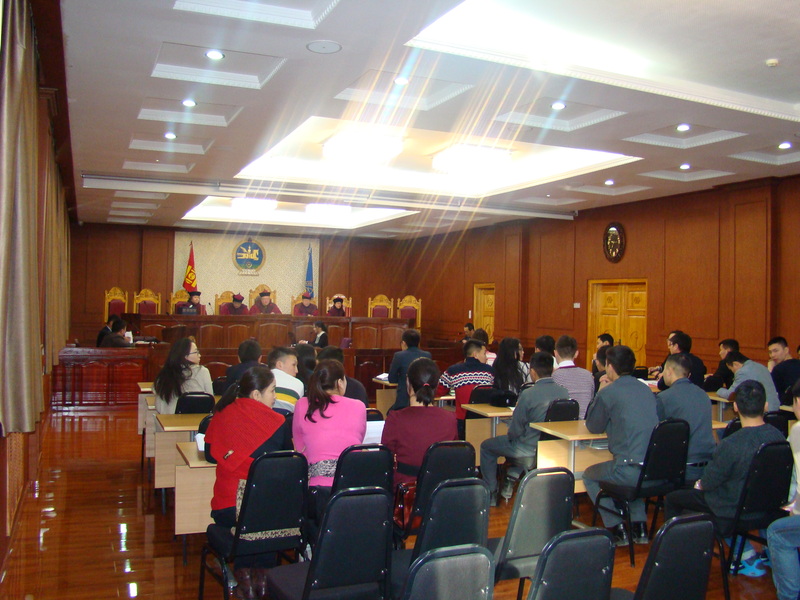 2.The compensation for the damage and other negative consequences caused to the state, citizens, and organizations by the unconstitutional laws, decrees and decisions of the State Great Hural and the President, other decisions of the Government, international treaties signed by Mongolia, decisions of the central electoral bodies shall be considered and decided by the authority or the official who adopted those laws, decrees, decisions, or signed or ratified the treaty, or by a court in accordance with the relevant law at the given time. A person who disrupts order at the proceeding of the Tsets may be removed from the court session hall by the decision of the presiding member after a warning. 2.A person who intentionally gives false statement, submits a wrong conclusion, opinion or document during the examination and consideration a dispute, if not subject to criminal responsibility, shall be fined; the citizen: from 1000 to 25000 tg, the official: from 300 to 30000 tg, the economic entity or organization: from 50000 to 75000 tg by the court. A person who offends or slanders with the purpose of obstructing or influencing the lawful activities of the Tsets, if not subject to criminal responsibility, shall be fined from 5000 to 50000 tg by the court.